Who's ready for an easy art project? This only takes about 15 minutes (easily even less. 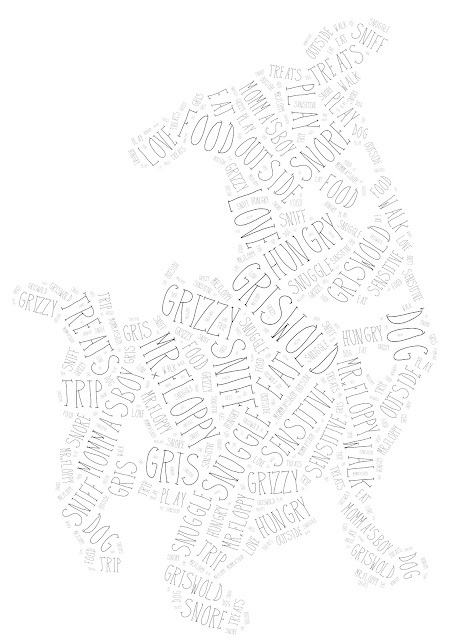 It'll probably take you more time to read this post) and is a sweet way for you to display all your dog's quirks. By now, I'm going to safely assume that anyone who is a teacher is familiar with Wordle. I am a typography whore, so I love the simplicity and impact text can have. 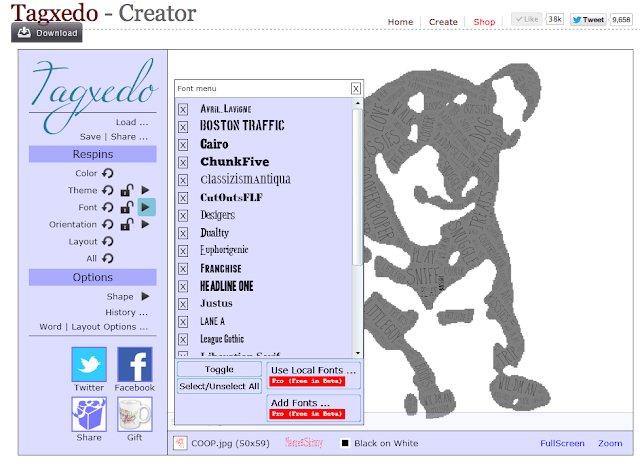 There's another program that allows you to turn a word cloud into shapes called Tagxedo. It's completely free (all features right now as they're still in beta mode according to the site). I'm so lazy this morning that I didn't even feel like opening Photoshop. So I went to iPiccy. It's perfect for what I needed. And adjust the threshold until I was satisfied with the overall shape. For Coop's picture, there was some background noise so all I did was go to the little art palette and erase anything I didn't want. Save your photo to somewhere on your computer for easy retrieval. Go to Tagxedo. There is no order to steps for this. 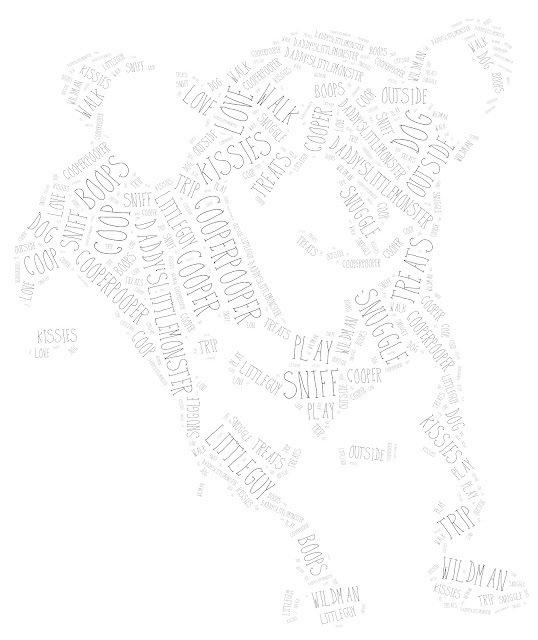 I totally just played around with it, but here's what I did. 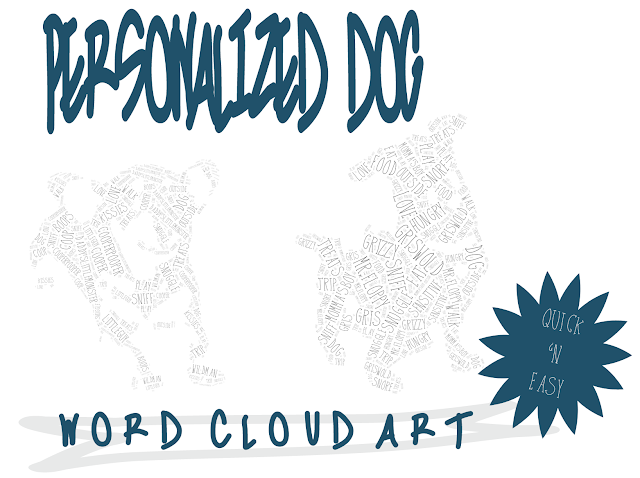 Click on "load" and then type in all the words that you want to include about your dog. I put in their names, nicknames, things they love, and things I love about them. If you have a website, you can load that and it will pull words used on it. Below I had already uploaded my image, but you don't have to worry about that first. 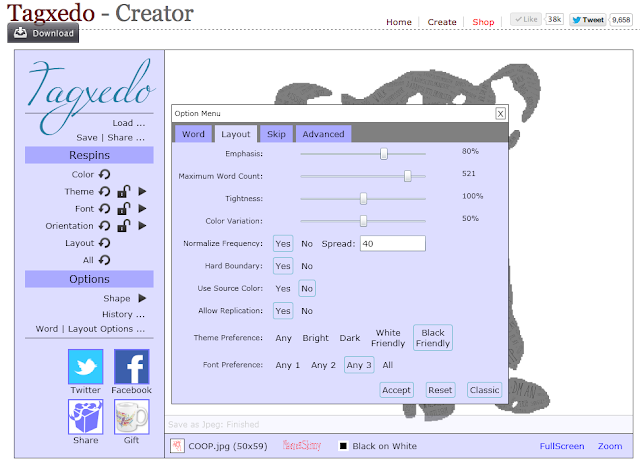 After you submit your words, you can choose your shape. Under "Options" click on the arrow next to "Shape." 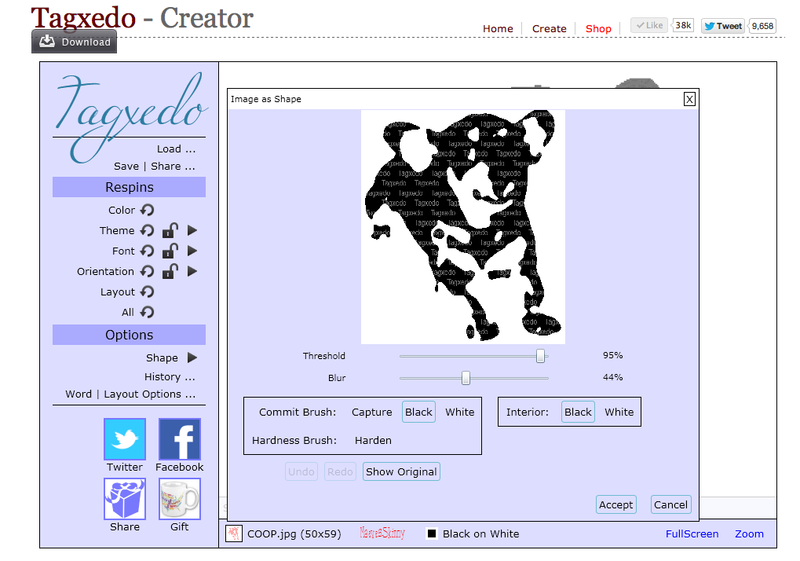 Select "Add Image" and upload your photo. You'll want to adjust the threshold to an outline/shape that you're satisfied with. Play with it to see the various effects. If you wanted your image to be inverse with white and the background to be black, you do that with the "Interior" option. After that, I chose the "Word | Layout Options" to adjust the amount of words or any characters I wanted to add (for instance, I wanted periods and apostrophes, so you have to add that to the "Word" tab). The more your increase the "Maximum Word Count," the more detailed your picture will be. Don't worry about that little red asterisk that will show up. It'll be fine. Promise. Another cool feature that I love love love about Tagxedo is that you can personalize what font you want to use. Just go to the "Font" option and click "Add Fonts" if you want to add one that's on your hard drive. Eep! Love it! 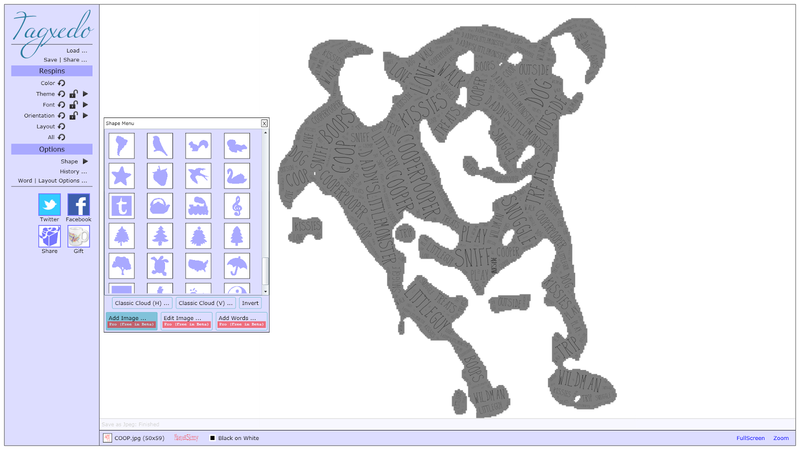 After you save your image from Tagxedo (you're given a ton of pixel options -- I always save the largest one because I never know what I may want to use it for), you will need to open it up and crop it. 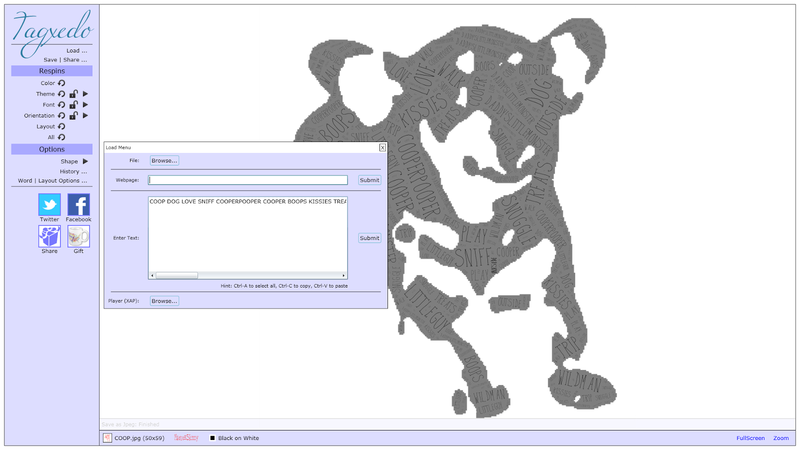 There will be a border around your image and "Tagxedo" with a copyright and date. I'm totally fine with that extra step because Tagxedo is awesome and free. After that, I uploaded my images to Sam's Club (or your favorite photo ordering site. Tagxedo also has some vendors plugged right in if you want to eliminate that step), put them on a gallery wrapped canvas (5x7's are only $7.96 for the month of May!!!!! ), and DONE! The hardest part is going to be waiting for them to come in and figuring out where to showcase them!